The fruit of several years’ research and development, field-tested by teachers without experience of conversation in Hebrew as a spoken language, Paul Overland’s new Hebrew textbook is startlingly original and immediately accessible and attractive. Its foundation is the theory and practice of Second Language Acquisition (SLA), which orients grammar so as to empower the student’s capacity for reading, hearing and expressing in Biblical Hebrew. Learning Biblical Hebrew Interactively offers a set of activities structured on a serialized narrative inspired by the book of Jonah. Working through it, the student acquires facility in communicating in Hebrew by expressing opinions, accomplishing tasks, or asking others to do something. It is a hands-on, interactive learning experience, hugely various, enhanced by its 230 illustrations and photos, and numerous inserts headed ‘Did you know that …?’ featuring interesting aspects of Hebrew culture. There are two volumes, which can be bought separately, and a version of the student edition that is designed for the instructor, with hints on how to use the textbook in a class setting. 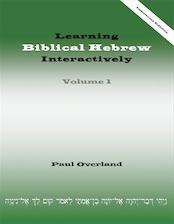 Each lesson in the textbook is enhanced by digital resources, freely downloadable from LearningBiblicalHebrewInteractively.com. Paul Overland is Professor of Old Testament and Semitic Languages, Ashland Theological Seminary, Ashland, Ohio.